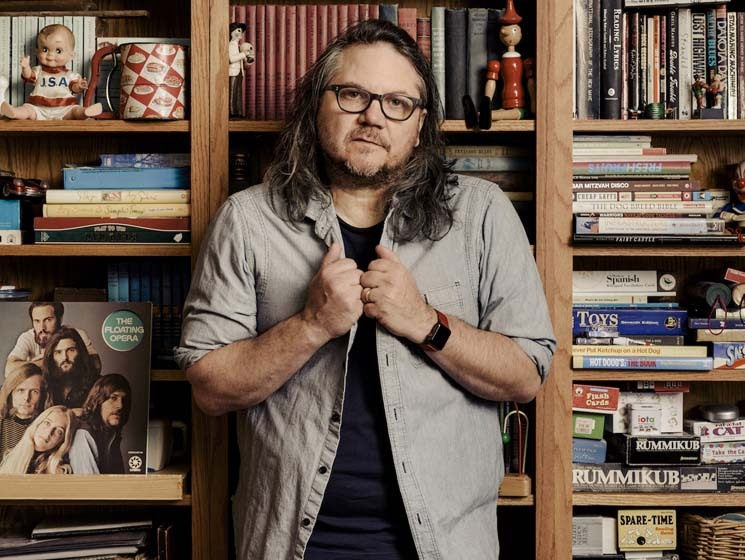 Jeff Tweedy is in Chicago, gearing up for interviews about his wonderfully revealing new memoir, Let's Go (So We Can Get Back), and its companion piece of sorts, a solo album of reflective and infectious new songs called WARM, which comes out November 30. With these things done, he's already contemplating his next move. "I am currently doing some preliminary recording and scouring some of my previous recordings for material for the upcoming Wilco recording sessions," he tells Exclaim! After his pioneering alt-country band Uncle Tupelo broke up suddenly, Tweedy started Wilco in 1994, cementing his status as one of rock's most adventurous musical and lyrical voices. He has given thousands of interviews in that time, and often comes across as a good-humoured intellectual who is open to new ideas and always listening. To music, sure, but also to people and their conditions and how they might relate to his own. In his new memoir, Tweedy chronicles his entire life in a rare feat that feels less self-serving and sensationalistic and more empathetic and instructive. "I will cop to that completely," Tweedy explains. "I feel like that when I do interviews or answer questions from fans after a show. I feel some obligation to be helpful. I feel very, very grateful that I get to do what I get to do with my life, and I think there are aspects of what I do that are consoling in and of themselves. Putting art and things out into the world that you believe are beautiful and doing so with a certain spirit — I think that's helpful. "But consciously thinking that when I was writing the book? I would say yeah, that made it seem worthwhile to write the book to me. That there might be some aspect of anything I'm relating that someone would find a moment of recognition in my life and might lay out a path forward for them"
In his liner notes for WARM, writer George Saunders suggests that Tweedy's aesthetic is so specialized, he is less of a singer or songwriter and more of a "consolation poet." There is a sense that Tweedy's audience looks to his music for some relief, and to him for some innate wisdom. But does he learn something about himself from writing his songs? "Yeah, I think that's gotta be the case, because I don't really start out with a lot of intent," he says. "I'm much more trusting of the process and trying to figure out what's gonna happen than someone who sits down and says 'I want to write a song about the solar system' or something." Throughout Let's Go (So We Can Get Back), Tweedy discusses the music and experiences that have shaped him. From buying his first Pilot and Aerosmith singles to begging his parents to get him Public Image Ltd.'s Flowers of Romance for Christmas, only to have his late dad scratch it when yanking the needle off the record in disgust, Tweedy always clamoured for music. He got to see early shows by the Replacements, bought merch off of D. Boon of the Minutemen, and was misled by Dee Dee Ramone. He also discusses his encounters with Bob Dylan, who invited Wilco, My Morning Jacket, Richard Thompson and the Grateful Dead's Bob Weir along for his Americanarama package tour in 2013. At its Toronto stop, Dylan invited members of other bands on stage with him and his own band, and you could see the joy in Tweedy's face when the two shook hands before playing together. "It wasn't the first time I'd interacted with him on that tour," Tweedy recalls. "We'd actually said 'hi' to each other, but it was definitely the first time I was invited out on stage, which was kind of amazing, because that was really how that tour was sold to everyone — it was going to be like the Rolling Thunder Revue and there would be a lot of collaboration between all the different entities. "We all did try and do that — Wilco, My Morning Jacket, Richard Thompson and Bob Weir all took that spirit, and were trying to make that work, playing with each other, collaborating and inviting people up to play with us wherever we were," he adds. "I think Feist might have played with us that day too. "Anyway, it didn't quite work out to be exactly what any of us pictured with Dylan, but he did start inviting us out — well, that was the first night. After that, he did have us out for most of the nights on that tour." Let's Go (So We Can Get Back) is available now via Dutton Books. WARM comes out via dBpm Records on November 30.